(Wake Up World | Sayer Ji) Chanting (mantra) is an ancient technology that, as modern science reveals, connects us in a very real way to the farthest reaches of the universe. I love chanting mantras, and I do so daily as an integral part of my kundalini yoga practice. I don’t need to know the specifics of how it produces a calming and sometimes even transcendent effect on my consciousness, but I’ve always been deeply curious about the mechanisms that may be at play beneath the surface of my awareness. This is why I am both deeply grateful and amazed by the work of John Reid, the UK inventor of the cymascope — a technology that renders sound visible. In an article published on his website titled, “Cymatics — A Bridge To the Unseen World,” John and his wife Annaleise reveal facts about sound that are simply mind-blowing and worthy of far greater dissemination. As you can see above, the sound is not produced in wave form but as a spheroidal beam. If you were to slice horizontally into the beam and look at the cross section it would appear to contain geometric patterns that contain a type of cymaglyphic information analogous to hieroglyphs. In other words, these sound structures carry information as real and meaningful as words do in human language. You create infrared light even when you speak… The atoms and molecules of air within this expanding bubble are bumping into each other, each collision transferring your voice vibrations to the nearest atom or molecule. As these ‘bumps’ occur they cause infrared light to be created due to the friction between the magnetic shells of the air particles. The infrared light carries with it the modulations of your voice that rush away at the incredible speed of 186,000 miles per second. Unlike the sound of a voice, which becomes inaudible after about one mile, the infrared light created by your voice rushes out into space where it travels for eternity, carrying your words or songs to the stars. What I find so amazing about this is that kundalini practitioners have long made claims about the power of mantra to connect us to the universe that on the surface may appear like pseudo-science. But the science that John Reid is speaking to — the actual empirical phenomena — now lends scientific support to at least some of these claims. We live in a remarkable time where what was once purely the stuff of myth, and considered magical thinking and “woo” by skeptics the world over, is starting to receive validation through the ‘hardest of sciences.’ For instance, the concept of the body radiating light is now also accepted through the discovery of biophotons which we reported on in a previous article, and even the ritual of burning medicinal herbs sage to ‘ward off evil spirits’ like has been found to have powerful cleansing properties. That said, the most powerful way to understand information like this is to experience it directly. 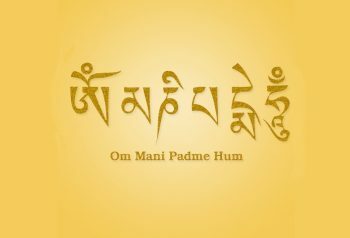 I encourage readers to experience the tradition of mantra directly. Listen or recite them, and visualize the sound actually moving at tremendous speed, and producing light that is extending out into the farthest reaches of the universe. Perhaps then the aphorisms of spiritual masters like Yogi Bhajan will no longer seem strange and unattainable. For more evidence-based research on the therapeutic value of chanting, please visit GreenMedInfo’s database on Chanting. To learn more about the CymaScope and a related project Sayer Ji and John Reid are partnering on, take a look at SystomeBiomed.